Turning 'I' into FAM'I'LY..: How Should I Feel..? It started with me getting in a bit of a tizz about how I should feel. Excited? Cool, calm & collected (hah!)? Positive? Sensible and realistic?.. I want to be stupid excited and positive but feel.. like that might be wrong somehow. I'm talking about regarding the outcome. I was shopping online at one of my favourite home accessory stores Casa Mia looking at signs for my kitchen (I'm redecorating) and I saw all these lovely signs about "family" that I wanted to buy for Lily's room. I put one in the basket and removed it, then added it, then removed it.. and on it went. I didn't buy it but it left me in a bit of a state. RIDICULOUS.. I know. But I couldn't work out whether I should be stubbornly positive and say "I AM going to be mum" or not tempt fate and wait. Which made me focus on the fact that some official may find something about me or my life that makes them genuinely believe I wouldn't be good enough. Not good enough to adopt? Or to parent full stop? How will I feel about that? Unlike so many others adopting, I don't believe there is any reason I couldn't conceive naturally right now and do have that option to fall back on, but how will my confidence be knocked if some woman says "no"? If they do say "no", should I be listening?? My instinct, says of course I should. They do this all the time, surely they'd know. But then.. chav and chavette up the road, get themselves knocked up and don't turn out the worst parents in the world so actually, what do they know? And then I got upset because I didn't have anyone (by anyone, I mean a partner) I could share this worry with. Which in turn made me get angry with myself for even being in this situation in the first place. For making the wrong choices in love and investing more time than I should have done on the wrong guy. And what if the right guy is just around the corner.. should I wait longer and do this with him? Which made me question why I was doing it all over again and did I think I could do it alone. In the end.. I sat with the adoption application form, all filled in and signed parked outside the postbox and drove away with it still in the car. 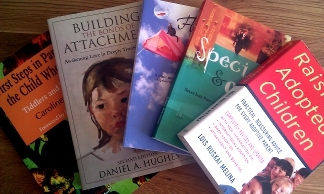 I ordered some books from Amazon, in preparation for the Prep Groups. They gave me a reading list and ask you to read at least one.. I may have gone a little overboard lol. Anyway.. I was expecting them Saturday and then they didn't turn up. Hassled Amazon - should be on it's way. Hassled CityLink - can't find it. Spent 40 mins on hold, for them to then cut me off and say the office was shut! Hassled by email instead - finally told they hadn't been sent them from Amazon yet. Hassled Amazon again - told they must have given them to the wrong courier but they had no idea which one and had no tracking info.. just wait. Waiting, waiting, and more waiting.. Which put me in a foul mood and seemed to just highlight why I'm here and what I'm struggling with. Waiting.. I don't want to wait any more to start my family. I don't want to put my life on hold for another guy.. I've done that. I want to do this.. I am SO sure I want to do this. Always have done, my gut from the first information evening said "this is right for me" and I know I could do this alone as I have everything else. But.. I've been wrong before.. I talked to my friends about it and they were wonderful as always. They trust me (more than I appear to trust myself!) and know I will only make the right decision for me and at the right time. They really believe that and that belief bolstered my own. They also helped me realise I am probably massively over-analysing this. If they say "no", they say "no". I can discuss why, appeal if necessary and re-assess my situation and my feelings about it based on their report. I AM still young, it's not the end of they do say "no". And if it works out, being a single parent does not mean I will never find someone, as one of best friends knows only too well! I said at the start this was a journey and as yet I don't know where it will end but I know I am on this path and I'm staying put. And I still don't know how I SHOULD feel.. but I know how I want to feel and therefore how I WILL feel. Positive. Positive that one way or another.. I am going to have the chance to be a mummy and I'm not letting anyone tell me otherwise and if I want to buy a sign for my baby's bedroom I will. It may be a year, or 2 or 3 before she sees it but she will. And she'll love it. This is not going to be the last wobble I'm sure (sorry guys!).. but think of me as a Weeble.. we may wobble, but we don't fall down.